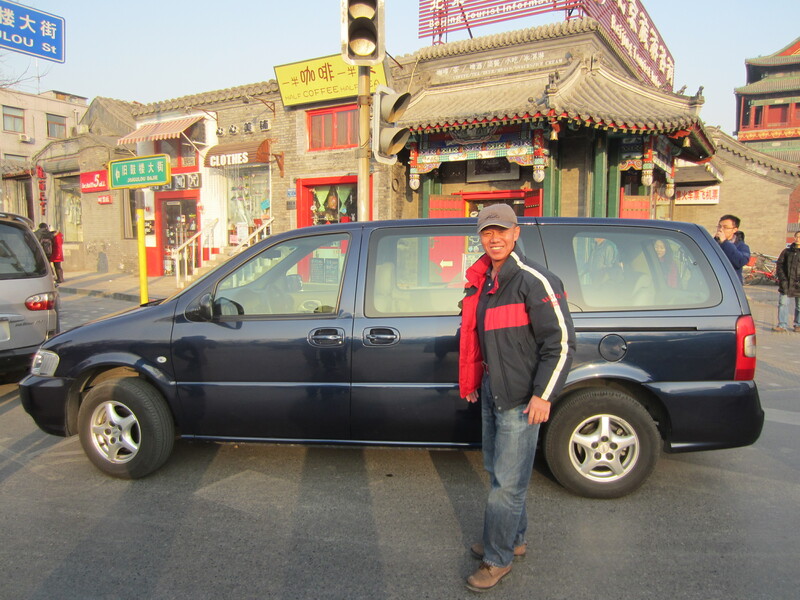 The greatest luxury of my life in Beijing, and our greatest expense, is our car and driver. Our driver’s name is Tony and, as anyone who has come for a visit can testify, he is a God. Unfailingly good-natured he shepherds us all over the city. He leans on his horn incessantly; drives John mad, I don’t even hear it. He winds his way though back alleys or along the shoulder to avoid traffic. He always manages to find a parking spot just where we will see him as we exit a restaurant or market. He drives safely and without ego, which is extremely rare in China. He keeps our Buick mini van spotless, yet never gets angry when Chowder jumps in with muddy feet. In Beijing you never wash a car; instead it gets swept with a big feather duster. He is incredibly flexible with his time, making himself available on holidays, late at night and at the crack of dawn. However, he does get two days off a week… one of which is our restriction day. All cars in Beijing are not allowed to drive one day a week depending on the last number of your license plate. Ours ends with 9, and this quarter we are not allowed to drive on Tuesdays. When Tony has a day off we are dependent on taxis. They are very cheap, but can be hard to find and terrifying to drive with. On taxi days, John starts muttering about getting his Chinese driver’s license. This is a terrifying prospect on so many levels. Luckily for my family’s survival, getting a license is not that easy. As a foreigner you must present translated copies of your passport, visa (with at least 90 days left on it), residents registration and a valid license from your home country. You then have to complete a medical test and get a certificate of good health. Lastly, you need to pass the dreaded written test. 100 questions. You must get 90% or better. For someone who has been driving over 30 years you’d expect this to be fairly straight forward…think again! What follows are 10 questions taken from the exam booklet as they translate them, (answers at the bottom)… let me know how you do! 1.After a vehicle falls into the water, the wrong method for the driver is to rescue himself is to ___. D. Use a large plastic bag to cover the head and neck closely. 2.When a vehicle overturns slowly and jumping out of the vehicle is possible, the driver should jump __. 3.When a running vehicle suddenly falls into water, the driver should _______ to escape. 4. When a vehicle rolls continuously to a deep ditch, the driver should swiftly hide his body to the lower space in front of his seat, hold _______ to stabilize his body so that his body will not roll and get hurt. 10. When overtaking, the driver should _______ if the vehicle in front refuses to reduce speed or yield.